The application note contains basic information about this type of reflector antennas. The WIPL-D MoM implementation is particularly well suited for simulation of reflectors, which is elaborated in details (quadrilateral elements of 2 lambda by 2 lambda, up to the 8th expansion order, adjusted for reflectors). 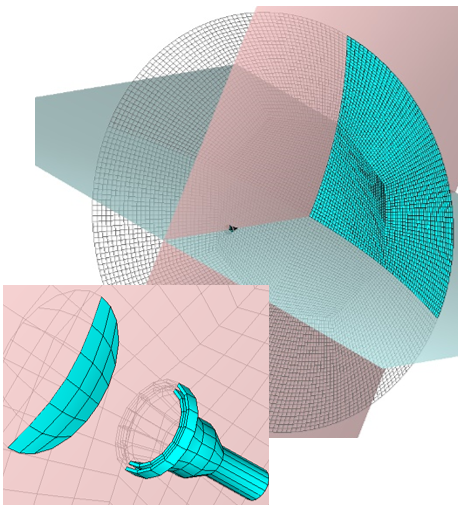 The approaches for building the model are specialized geometrical objects in WIPL-D Pro, import from a CAD file or user-defined shape (script file). The results (200 lambda reflector in Ka band) demonstrate that it is possible to simulate very large reflector antennas in WIPL-D software by using regular desktop PC, especially if equipped with low end Nvidia GPU cards. WIPL-D Pro is well-established full wave 3D EM solver based on state-of-the-art MoM. MoM is inherently suitable for radiating problems and simulation of electrically moderate and large structures. A typical example are reflector antennas, with diameters measured in tens or hundreds of wavelengths. Unique features allow WIPL-D to be unbeatable tool for full wave simulation of electrically large reflectors: quadrilateral mesh, HOBFs, efficient parallelization on multi-core CPU and support for inexpensive GPU cards, built-in reflector pre-meshed primitive. 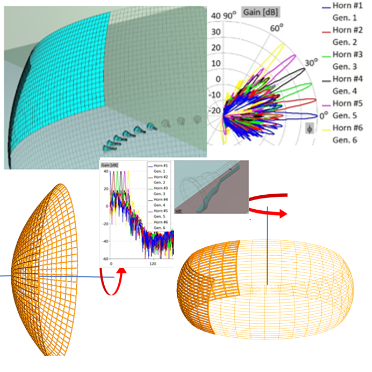 Torus reflector antenna (TRA) is a quasi-parabolic antenna, where the parabola is rotated around an axis which stands vertically to main transmission axis. TRA does not offer excellent aperture efficiency as parabolic reflector.If illuminated with several fixed antennas, it offers an efficient multi-beam operation. By using anti-symmetry and asymmetry, the number of unknowns is reduced 4 times (less than 25,000 unknowns). Reflector aperture is ~1.8×3 m (60×100 lambda). The kernel runs twice at standard desktop PC. Entire simulation time is measured in minutes and can be additionally speed up by using low-end Nvidia GPU card. 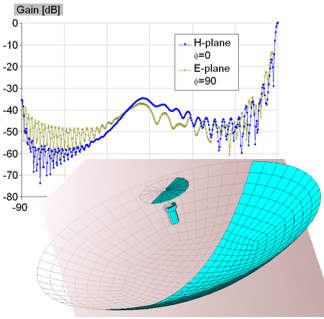 Very large Cassegrain antennas are usually simulated using specialized asymptotic methods. 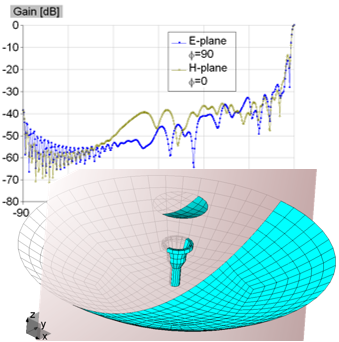 However, WIPL‑D Pro simulates antennas of this type using very accurate and very fast Method-of-Moments with higher order basis functions which results in very high numerical efficiency. Due to the efficient parallelization on modern multi-core computers, CPU simulations are very fast for problems of this size. Further acceleration can be achieved by using GPU Solver and inexpensive Nvidia GPU cards. 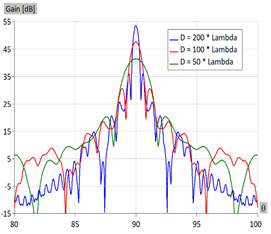 The application note presents number of unknowns and CPU/GPU simulation time for a series of reflector sizes (from 20 to 200 lambda). This paper presents the procedure for the design of splash plate reflector antenna. It contains theoretical consideration and foundation, as well as procedure for design in the WIPL-D software suite. Splash plate reflector antenna consists of two parts: feeding cylindrical waveguide with splash plate sub-reflector, and main parabolic reflector. Thus, the design procedure is approximately divided into two steps corresponding to the design of single part. Finally, the app note shows WIPL-D Pro model at 25.5 GHz, its radiation pattern and the simulation details. Simulation is carried out in seconds at inexpensive everyday PC. 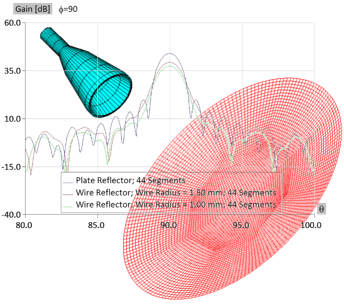 Simulation of reflector antennas can be very challenging for MoM codes. Despite that, WIPL-D Software, as MoM code based on SIE, appears to be very suitable and efficient tool used for simulating large reflector antennas. Reflector, as part of the reflector antenna, is usually made of metallic surface. However, it also can be made of relatively thin wires. This can be a realistic reflector, but such model can also serve as wire grid model of the solid reflector. In the application note, plate and wire reflector illuminated by choke horn are both simulated. The results are compared, while the simulation efficiency of the wire grid model is clearly shown by the required resources and the simulation time. This paper presents the procedure for the design of Cassegrain reflector antenna. It contains theoretical consideration and foundation, as well as procedure for design in the WIPL-D software suite. 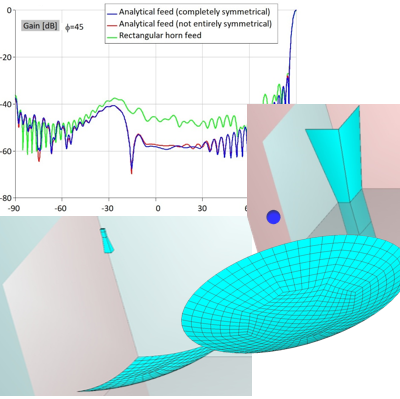 Cassegrain reflector antenna consists of two parts: feeding conical horn with hyperbolic sub-reflector, and main parabolic reflector. Thus, the design procedure is approximately divided into two steps corresponding to the design of single part. Owing to the efficient implementation of method-of-moments, WIPL-D Pro EM software is able to solve electrically large reflector antennas (here, splash plate reflector antenna with shroud, absorber and radome) in dramatically small computational time at regular desktops or laptops. This is also efficiently shown in numerous application notes and reflector antenna guides available at the WIPL-D web site. 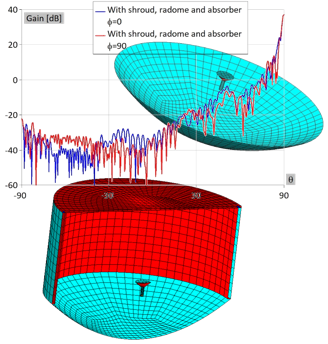 In this application note, efficient WIPL-D simulations are briefly described by showing a basic splash plate reflector antenna with the shroud, reflector and the absorber. The antenna itself has feeder illuminating 35-lambda reflector (operating frequency is 16 GHz). The EM simulation of the feeder is advanced considering the shape of the splash plate and the dielectric support included. Such simulation can be run in seconds at any modern laptop or desktop. As an advanced level of reflector antenna simulation, the antenna is modified by adding metallic shroud, which is then covered with the dielectric absorber. In the final step, a simple flat radome is added to cover the aperture. The results indicate the dramatic effect of the shroud to front to back ratio. Adding absorber further improves front to back for another 10 dB, but such lossy material reduces the gain for 0.8 dB. Theoretically maximally transparent radome does not compromise the gain and front to back ratio. All models are simulated at the regular desktop PC equipped with single inexpensive GPU card. With WIPL-D software, this transforms the regular desktop into powerful workstation. The simulation times are rather low.